The Battle of Hodeidah is will determine the battle of Sana'a and prolonging the war is a future burden on the Yemeni legitimacy and the coalition alike. An assessment study conducted by the Strategies Unit in the Abaad Center for Studies and Researches Center on the National Army under the legitimacy of President Abd Rabbo Mansour Hadi and supported by the Arab Coalition says that scenarios of the battle in Hodeidah will be reflected on the battles in fronts surrounding Sana’a. It says that only half of the National Army, which consists of 200 thousands fighters, is effective while 20% are new untrained recruits and corrupt military commanders, in addition to a high percentage of wounded and killed soldiers, almost reach 15%, due to the lack of safety tools such as helmets, chest protectors, armored vehicles and minesweepers. The study suggests that the scenario of military operation in Hodeidah and resolving the battle of the West Coast militarily will encourage other fronts to move on, including those fronts surrounding Sana’a. it says that if the Arab Coalition, supported by the international community, could subjugate the Houthis and restore the city of Hodeidah and its port, that will be a prelude to actual negotiations about Sana’a. The study says that the third scenario, the Sharing and Quotes Scenario, is the most disturbing scenario for the Yemeni government and the Arab Coalition, as the suspension of military operation in Hodeidah under the international pressure will result in imposing negotiations with the Houthis in general and the acceptance of any political solution that guarantees the presence of the Houthis militias in the state and ensures their share in power without paying the cost of the war they waged. The study, in Arabic and English, dealt with the reasons of the disassembling of the Yemeni Army institution, which made it easy to be broken down by the Houthis group, and how that helped the Houthis to take over the governorates, including the capital Sana'a, and led to the appearance of the popular resistance with regional concepts until the National Army was reformed in conjunction with the begging of the Arab Coalition’s “Decisive Storm” in Yemen in March 2015 where semi-formal formations with multiple-loyalties appeared. The 50-page study is based on a research methodology that is based on data analysis via filling out a questionnaire that includes answers from military personnel and interviews with about 15 military commanders. The study presents an assessment of each military unit through points between 1-10, and an approximate number of soldiers in each participating brigade. 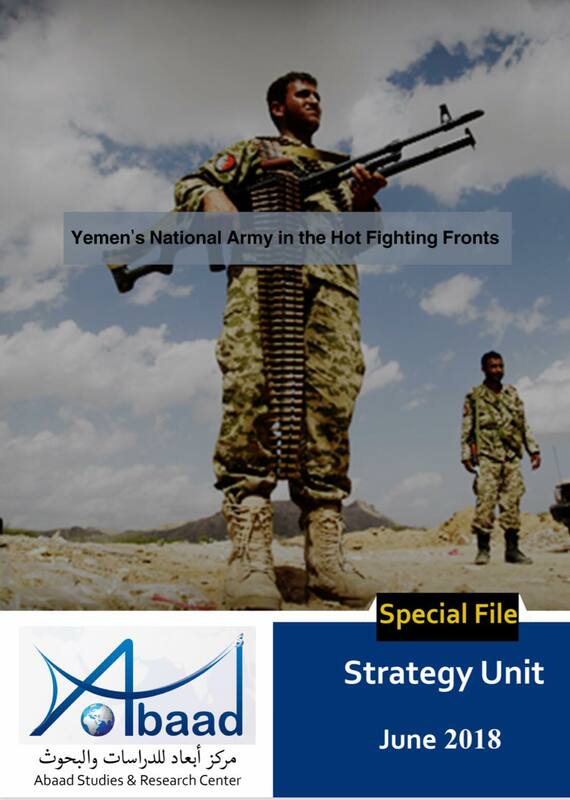 Under the title “Sana’a Gates,” the study explains the situation in Serwah fighting front, which belongs to the 3rd Military Region and in the Nehm front that belongs to the 7th Military Region. It points out that the front of Serwah contains 8 brigades and combat units with more than 13,000 fighters, while the front of Nehm contains 18 brigades and more than 23,000 fighters. According to the study, Serwah front is important because it represents the last stronghold of the Houthis in west of Marib. The study says that with the liberation of this front, the government forces will exceed Marib towards “Khawlan,” the first district of the capital Sana'a and its south-east gate. The study says that Nehm is the first district of Sana'a governorate and its eastern gate with an area of ​​more than 1841 square kilometers. It is characterized by mountainous ranges that directly overlook the capital Sana'a. It is about 60 km away from the center of the capital Sana'a. Nehm is parallel to the Arhab district (Nehm and Arhab together represent one third of the general area of Sana’a). Bani Hushaish district locates between Nehm and the capital Sana’a. Nehm represents an easy access to Sana’a International Airport. The study confirms that Al-Bayda governorate is a strategic path to reach Sana'a as the governorate has borders with eight other governorates and is the way of the Houthi supplies to different fighting fronts. It is located near Dhamar, the southern Sana’a gate. It is the training center for most of the Houthi group's recruits and the storage of its fighters. The study points out that the fighting front of Al-Bayda contains about 10 brigades and combat units with more than 14,500 fighters that belong to the third Military Region. The study says that those forces can progress through two axes. The first axis passes through Al-Bayda-Marib-Qaniya, and the second axis passes through Beihan (in Shabwa) towards Noman and Natee. According to the study, Al-Jawf governorate, which is part of the Sixth Military Region, also has a strategic location making it a central front for the National Army to progress in two directions. The first direction is towards Sana'a and Amran, and the second direction is towards Sa’ada. The front contains 12 brigades and a combat unit with more than 17,000 fighters in a terrain that is less difficult than Sana’a. The study describes the governorate of Sa’ada, the stronghold of the Houthi group, as the most dangerous front as most of the ballistic missiles that target Saudi Arabia come from Sa’ada. The study stresses that there are three important military fronts in Sa’ada including Kitaf-Al-Boqe, Baqem- Mandaba and Razih, which contain about 14 combat brigades and a combat unit with more than 13,000 fighters who belong to the Sixth Military Region. On the west coast, particularly on the way to Hodeidah, the most important outlet for weapons smuggling, as well as a major source of income for the recruitment of Houthis, the study says that the "Government forces, backed by Sudanese and Emirati forces, are fighting to protect the city of Aden from Houthi attacks. By mid-May 2018, the government and the coalition troops advanced rapidly on the west coast and progressed 50 miles in days until they reached only 10 miles from the port and city of Hodeidah, which has been under the control of the Houthis since 2014." This front, which also follows the Fourth Military Region, is a wide front, where more than 20,000 fighters are fighting in five brigades to secure the outskirts of Hodeidah. There is a sixth brigade for support and a seventh one under rehabilitation. Two of the brigades will be assigned to enter the city of Hodeidah. Tihama brigades will be assigned to control the countryside of Hodeidah and some areas of Tihama. Among the brigades, there are special battalions of the Zaranik tribes, known for their brutal combat. They will support the forces in the countryside of Hodeidah and its environs. There are Special Forces, which are affiliated with Tariq Saleh, the nephew of former president Ali Saleh. Their task will be to secure the secondary cities and villages outside Hodeidah. There are other two brigade, one brigade is led by Major General Haitham Qasim Taher, and another one led by Nabil Mashuchi, commander of the UAE-backed security belt in Aden. The study pointed out that most of the fighting fronts suffer from obstacles related to the irregularity of salaries, weak armament, lack of experience, lack of training and the presence of financial and administrative corruption, in addition to the lack of unified operations rooms between the coalition and the legitimacy and the high rate of disability and killing due to the lack of safety tools such as helmets, shields and minesweepers. In addition, some fronts do not have modern weapons to counter the Houthis, who are stronger for their Kornet missiles that the National Army does not possess, in addition to planting unprecedented number of mines. In Hodeidah, the study points out that the most important obstacles to the military solution is the large area that needs many fighters to cover, in addition to breakthroughs by the Houthis due to the multiple loyalties of various forces there. The study says that taking a new route in the West Coast, instead of Zabid, Al-Jarahi and Beit Al-Faqih brought the Army easily to Al-Dureihimi. But the delay in liberation of those areas impeded the access to the city as the Houthis shell the government forces, especially in Al-Faza and Al-Jah areas, to cut the supply lines. In comparison to Nehm, the study says, "The West Coast Front is the most armed and equipped front, it exceeds other fronts in the country in the number of armored vehicles, tanks and patrols.” The minesweepers are also available permanently and the land, air and naval forces participate in a regular operation. The fighters have motivations to continue fighting and they have advanced field hospitals to receive urgent medical care. In addition to the availability of Special Forces (Yemeni – Sudanese - UAE) to save the fighters, if they are subjected to "siege" or supplies are cut off. The study suggests that the wrong strikes formed one of the most important factors behind slow progress of the military forces and the imbalance of confidence between the coalition and some combat units of the Yemeni Army. The study added that "the National Army was subjected to wrong raids by the coalition aircrafts and sometimes artillery from behind, due to several reasons, the most important of which is the absence of joint command and control centers in each front to coordinate the movement on the ground and the air raids. More than 300 soldiers were killed and wounded in 14 wrong raid strikes on military sites since the beginning of operations in March 215. The study recommends not to prolong the war because the coalition and the Yemeni legitimacy will bear more political and humanitarian burdens that will have repercussions, even after the end of military operations. It also recommends a quick reform of imbalances in the army, solving the problems of salaries payment and treatment of the wounded and the rights of the families of martyrs, and the integration of all military formations in the National Army and security forces, and the launch of building up the naval and air forces to cover the security vacuum after liberation particular in ports and airports. It recommends the training and rehabilitation of those who have been recruited in the military institutions. It calls for the launch of services and family care for displaced families and return them to their areas with the beginning of reconstruction in each region where war came to end, because the stability of these areas helps to liberate the rest of regions, especially the capital, Sana'a.